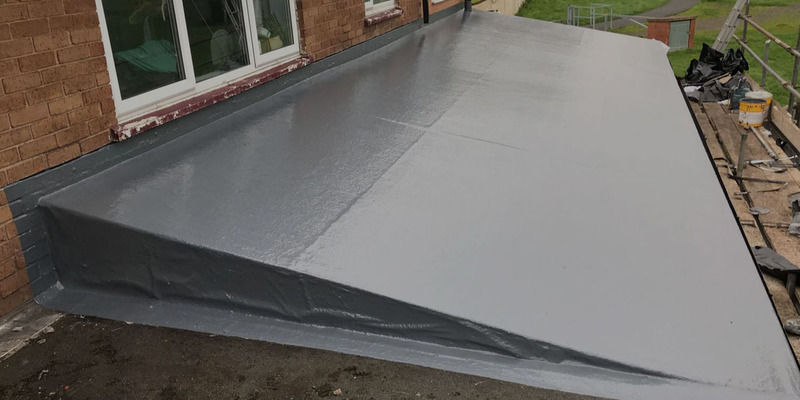 As approved installers of GRP fibreglass roofing system, Flat Roof Direct are highly experienced contractors. This form of commercial flat roofing is an extremely popular alternative to the traditional roof covering materials due to the many advantages. It can provide extremely tough, reliable and durable roofs that will outlast other materials. GRP Fibreglass roofing is very hardwearing, can be used on walkways and can be used for balconies/roof terraces when reinforced appropriately. One of the main advantages of GRP flat roofing systems is the seamless finish. GRP Fibreglass Roofing is multiple layers of cold applied resins which are reinforced by fibreglass matting. Cold applied resins as the name suggests means that no naked flames are needed to install this material. The seamless finish reveals no joins or welds and is completely waterproof. GRP roofs are particularly attractive. It comes in a variety of colours and finishes. The appearance and wide range of colours and bespoke finishes suit many different requirements. For example, simulated lead roll effect roofs can be used to match a real lead roll roof area. Fibreglass roofing is a safer and more secure option for a low-level roof and has the main advantage of no scrap value. Shapes around pipes, design features and other roofing requirements are possible with GRP Fibreglass Roofing. It is a tough, hard-wearing surface – fully reinforced with glass fibre. The rapid curing is a cool cure system, applied at zero degree temperatures. It is also fully fire retardant. Recognised by the BBA, GRP Fibreglass Roofing is an approved material. Building control professionals, government departments, architects, local authorities, specifiers, and insurers all recognise this authority. Discover more about GRP Fibreglass Roofing. Please contact us for more examples of the best places to use this roofing material and ask for a free no obligation survey. Flat Roof Direct can be contacted by telephone, email or by using the online contact form on this website.